Our Rasoret collection is perfect for a guy who does not like being too flashy, but also can show some style. out on the town to a business meeting with big clients. This also comes in a 4mm. Q: What kind of binder material was used for this ring? We use Nickel as a binder for all of our tungsten rings. All of our rings are Cobalt Free, no matter if you purchase from us or another company, make sure they are Cobalt Free. Cobalt is what turns your ring green, you want to stay away from those. Hope this helps! Q: Could we order this ring and make sure it fits and then send it back to have it engraved once we know it fits? Other than the ring running a bit small to size, the ring is great. It's heavy, durable, and my fiancé likes it a lot. He's not much of a ring guy, but he really liked the ring and it looks great on his hand and finger! I thought the site might be sketchy especially because of the low price, but it wasn't. I got my order in a timely fashion which I always appreciate! The ring overall is great, while the engraved script places it on a level above great. I'm looking forward to ordering more rings in the near future and will recommend this site to everyone who have interest in Tungsten rings. Thanks! It took forever to get the first ring shipped out and to us, but I believe that was because of the USPS system, and not tungsten fashions. In fact, the actual company was helpful because when we received the incorrect size, we were able to send it back and get a new one at no cost. The ring fits my fiance great and we are so happy with the quality. Very classy bands without being flashy....excellent quality & service. The ring is exactly as described and expected - beautiful. AND - the customer service was great. Why pay more? The ring on my original order was a little tight, so I returned it for the Rasoret style ring in a half size larger. Received my new ring within a week, and I am very satisfied. Ring looks great, very good quality, and fits very well. Couldn't be more pleased with the service of Tungsten Fashions. Thank you! I got this for my fiancés wedding band and we couldn't be happier! It fit him perfectly and it's very good quality! My husband & I have were married in 03 and we originally had for, both of us, a white gold ring that was on the smaller size. We had to pay an arm & leg for his. He has his big old sausage fingers. He was a mechanic. When he was working he would take his ring off, one day it disappeared. I am so happy about the ring that I ordered and how excited i was to find a size 16 1/2. I was able to surprise my husband with a brand new beautiful well constructed ring. Your company have made two people very happy, he loves it. This Tungsten ring fits perfect. The process of ordering and the more than reasonable price have allowed me to feel like I did not need to spend hundreds on a quality wedding band. Thank you! We've both been married before and we were looking for something simple. Neither of us wanted diamonds and the stress of having to make sure prongs aren't damaged and diamonds lost (been there, done that!) So tungsten rings really appealed to us. We are very happy with our selection. Based on previous reviews, we ordered them a half size larger than we were measured, but we found that they were too big, so we returned them for the correct size and it was a perfect fit for both of us. The return was hassle free. Our wedding is in a few weeks and we are super excited to start wearing these rings! Love the ring. Great price. Quick shipping. Great engravement. What a great ring! My wife and I looked at similar rings to use as my wedding band all over and they were $200 more at the least, simply because they were being sold in a jewelry shop. This ring is durable, sleek, comfortable, looks amazing, and is incredibly cost efficient. I had originally ordered the wrong size, but Tungsten Fashions replaced the ring for me at no cost and got me the proper size. Very happy with this ring. 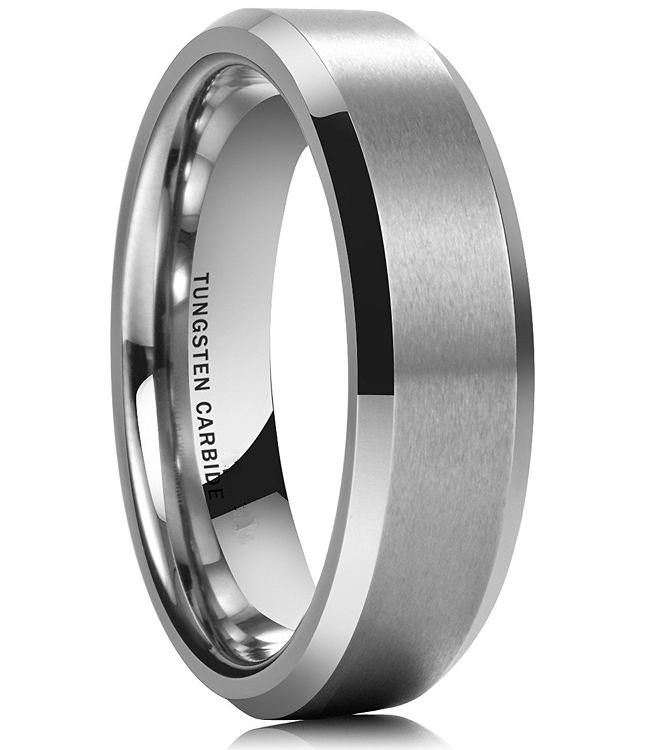 I just bought the Rasoret 7mm Tungsten Carbide Ring and it looks amazing. The finish is stunning and the fit is even better. The quality is the reason why I keep buying rings from Tungsten Fashions. The rings never scratch when I'm at and out about. I've countlessly bump my ring into things yet the ring stays beautiful each time. The price is also great. Can't beat it. The ring came quickly, and as advertised. Very easy transaction, good product, and excellent price. This ring is stunning! My husband and everyone else loved it! Best bargain for beauty, quality and durability. Staff are also awesome! Thanks again for making our day special! I am very pleased with my new ring. I did my research and found out that retail stores have a big mark up on their items. That's why they can offer %70 off and they are still making money . My ring is very good quality and I enjoy wearing it. Thanks. Fit perfectly and arrived on time!